Cicero T. Holcombe was employed at Camden and Amboy RR. He married Sarah Anderson Herbert, daughter of James L. Herbert. Cicero T. Holcombe was born on 8 July 1825. He was the son of Joseph Holcombe IV. Sarah Anderson Herbert was the daughter of James L. Herbert. Sarah Anderson Herbert married Cicero T. Holcombe, son of Joseph Holcombe IV. Real estate Broker, Trenton, NJ. William Anderson Holcombe was born on 3 November 1869 at Bordentown, NY. He was the son of Cicero T. Holcombe and Sarah Anderson Herbert. [S25] Hannah McPherson, Holcombe Genealogy, Page 99.1/Item A-6-7-5-4-1-1-1. Rosanna Adams married Dryden Holcombe, son of Joseph Holcombe III and Olive Marshall. Rosanna Adams was born at CT. She was the daughter of Richard Adams Jr. and Miriam Case. Corinthia A. Holcombe was born in 1822. She was the daughter of Dryden Holcombe and Rosanna Adams. 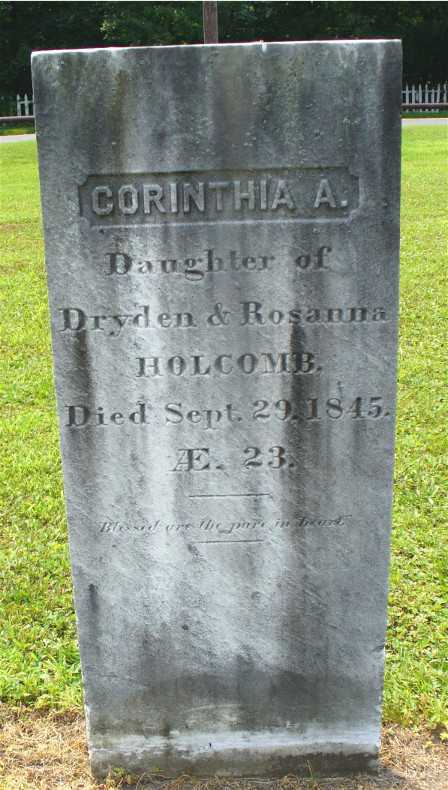 Corinthia A. Holcombe died on 29 September 1845. She was buried at Elm Grove Cemetery, Windsor, Hartford Co., CT.
Letitia is recorded in the 1850 Census of Windsor, CT, living with Daniel and Maria Kinney. Letitia Holcombe was the daughter of Dryden Holcombe and Rosanna Adams. Mary Holcombe was born in 1830. She was the daughter of Fredrick Winthrop Holcombe and Keziah Wood. Alfred and Jerusha were enumerated in the 1860 South Bristol, Ontario Co., NY, federal census. He was a farmer age 28, she was 29. Children in the household were Sarah Jane 7, Ellabiola 3, and Marietta 6 months. Eliza Holcombe was born in 1846. She was the daughter of Fredrick Winthrop Holcombe and Keziah Wood. Simeon Holcombe was born in 1848. He was the son of Fredrick Winthrop Holcombe and Keziah Wood. F. C. and Elizabeth were enumerated in the 1860 South Bristol, Ontario Co., NY, federal census. He was a farmer age 35, she was 22. Children in the household were Frederick 2, and Valentine 3 (months?). Brother Alfred was enumerated nearby. Cicero F. and Elizabeth were enumerated in the 1870 South Bristol, Ontario Co., NY, federal census. He was a farmer age 46, she was 31. Children in the household were Frederick 11, Frank 9, and Wm. 8. Frederick C. and Elizbeth wre enumerated in the 1880 South Bristol, Ontario Co., NY, federal census. He was a farmer age 55, she was 40. Children in the household were Frederick B. 21, Frank 20, Willis 18, Winnie 9, and Clinton N. 5. Frederick and Elizabeth A. were enumerated in the 1900 South Bristol, Ontario Co., NY, federal census. He was a farmer age 75, she was 61. Children in the household were Frederick B. 41, and Clinton N. 25. Widow Elizabeth was enumerated in the 1910 South Bristol, Ontario Co., NY, federal census, age 71. Son Frederick B. age 51 was also in the household. [S25] Hannah McPherson, Holcombe Genealogy, Page 99/Item A-6-7-5-7-1-5. Anna Holcombe was born circa 1812 at NY.2 She was the daughter of Fredrick Winthrop Holcombe and Keziah Wood. Anna Holcombe married Sterling Penoyer. [S25] Hannah McPherson, Holcombe Genealogy, Page 99.2/Item A-6-7-5-7-1-6. Lydia Holcombe was the daughter of Fredrick Winthrop Holcombe and Keziah Wood. Lyman and Mary E. were enumerated in the 1870 South Bristol, Ontario Co., NY, federal census. He was a farmer, age 23, she was 22. The only child in the household was M. Adell, 3. This Lyman is only shown as a son of Frederick Cicero because he was enumerated one house down from him. Lyman and Mary E. were enumerated in the 1910 South Bristol, Ontario Co., NY, federal census. He was a farmer, age 62, she was 61. They had been married 39 years, had only one child that was no longer living. Lyman and Edna were enumerated in the 1920 South Bristol, Ontario Co., NY, federal census. He was 72, she was 71. Eliza Holcombe was the daughter of Frederick Cicero Holcombe and Elizabeth Adelia Hawkins. Harriet Holcombe was the daughter of Frederick Cicero Holcombe and Elizabeth Adelia Hawkins. Frederick Benson Holcombe was born in August 1858 at NY.1,2 He was the son of Frederick Cicero Holcombe and Elizabeth Adelia Hawkins. Frank and Carrie were enumerated in the 1900 South Bristol, Ontario Co., NY federal census. He was a carpenter age 40, she was 28. They had been married 12 years and had had only one child. Beulah was listed as 6. Frank and Carrie were enumerated in the 1910 South Bristol, Ontario Co., NY, federal census. He was a house carpenter age 50, she was 38; they had been married 20 years. Their only child was Beulah 16. [S25] Hannah McPherson, Holcombe Genealogy, Page 99/Item A-6-7-5-7-1-5-4. Willis and Lucy were enumerated in the 1900 South Bristol, Ontario Co., NY, federal census. He was a farmer age 38; she was 35. They had been married for 11 years, Lucy had produced 3 children, all still living, and the children in the household were Maude 11, Rose 6, and Lucy 5. Willis and Lucy were enumerated in the 1910 South Bristol, Ontario Co., NY, federal census. He was a farmer age 48, she was 44. Children in the household were Maude 20, and Rose 17. Lucy T. was enumerated in the 1920 South Bristol, Ontario Co., NY, federal census, a widow age 54. Children in the household were Maude 28, and Rose 25. A son Willis William II did not appear in any census. He is apparently not of this household. [S25] Hannah McPherson, Holcombe Genealogy, page 99.2/Item A-6-7-5-7-1-5-5. Minnie Minton Holcombe was the daughter of Frederick Cicero Holcombe and Elizabeth Adelia Hawkins. [S25] Hannah McPherson, Holcombe Genealogy, Page 99/Item A-6-7-5-7-1-5-7. Clinton Norton Holcombe was born in February 1875.1 He was the son of Frederick Cicero Holcombe and Elizabeth Adelia Hawkins. Beulah Holcombe was born circa 1897 at NY.1 She was the daughter of Frank F. Holcombe and Carrie Salsich. Beulah graduated from Naples, NY High School and taught in S. Bristol, NY. Willis William Holcombe II married Lucy Kenney. Willis William Holcombe II was the son of Willis William Holcombe and Lucy T. Brady. Maude Elizabeth Holcombe was born in October 1889 at NY.1,2 She was the daughter of Willis William Holcombe and Lucy T. Brady. Maude Elizabeth Holcombe lived at 200 Elm Place, Leonia, NJ. Maude graduated from Canandaigua Academy, Elmira College and Columgia University; taught English in Englewood and Hackensack, NJ, High Schools. Rose B. Holcombe was born in August 1893 at NY.1,2 She was the daughter of Willis William Holcombe and Lucy T. Brady. Rose B. Holcombe died in 1935. Rose graduated from Canandaigua Academy and Elmira college; taught English at Englewood and Hackensack, NJ, High Schools and is author of poems, among them "Anthology of Coll. Verse, 1920-21." Lucy Kenney married Willis William Holcombe II, son of Willis William Holcombe and Lucy T. Brady. Lucy Kenney died in 1904. Information provided by Kathy Mangold, kmangold@c4systm.com. Lydia Buell married John Collins, son of Rev. Timothy Collins and Elizabeth Hyde. Lydia Buell was born in 1742. She was the daughter of Capt. Jonathan Buell and Lydia Landon. Lydia Buell died in 1790. John Collins married Lydia Buell, daughter of Capt. Jonathan Buell and Lydia Landon. John Collins was born in 1739. He was the son of Rev. Timothy Collins and Elizabeth Hyde. John Collins died in 1792. John Collins Jr. was the son of John Collins and Lydia Buell. Information from kathy Mangold, kmangold@c4systm.com. Norman Collins was born in 1769. He was the son of John Collins and Lydia Buell. Norman Collins married Elizabeth Hurlburt, daughter of Josiah Hurlburt, in 1787. Elizabeth Hurlburt was born in 1769. She was the daughter of Josiah Hurlburt. Elizabeth Hurlburt married Norman Collins, son of John Collins and Lydia Buell, in 1787. Information provided by Kathy Mangold, kmangold@c4systm.com. Sarah Collins was born in 1800. She was the daughter of Norman Collins and Elizabeth Hurlburt. Sarah Collins married Samuel Steele in 1821. Sarah Collins died in 1855. Samuel Steele was born in 1800. He married Sarah Collins, daughter of Norman Collins and Elizabeth Hurlburt, in 1821. Samuel Steele died in 1862. Information provided by Kathy Mangold, kmangold@c4systm.com. Catherine Steele was born in 1835. She was the daughter of Samuel Steele and Sarah Collins. Catherine Steele married John Rogers, son of (?) Rogers and Rebecca (? ), on 28 March 1859 at St. Charles, MO. Catherine Steele died in 1907.